Located strategically in the center of Kuta area, in the cross road of Sanur-Kuta-Seminyak- Nusa Dua, Grand Mega Resort and Spa Bali is designed for easy travel around the town. It is only 2 km from the city center, less than 20 minutes from the famous Kuta Beach, Ngurah Rai International Airport, and the capital city, Denpasar. Besides that, some shopping venues such as Mall Bali Galeria or Kuta Square are nearby. The strategic location of this hotel ensure that the guests could visit various interesting places within the town quickly and easily. This 3.5 star hotel carrying the concept of boutique hotel. The hotel is dominated by the flashy and elegant color of violet. The excellent service and complete facilities of Grand Mega Resort and Spa Bali are provided to create a memorable stay in the paradise island. Meeting facilities, coffee shop, elevator, 24hr room service, shuttle service are just a few examples of the facilities that set Grand Mega Resort & Spa Bali apart from other hotels in the city. Featuring 135 Deluxe and spacious Suites rooms, Grand Mega Resort and Spa try to provide the best way of staying in Bali. These rooms are designed in the mixture of traditional and Balinese traditional architecture to give the typical experience of Bali. Guests can choose from these rooms to feel the peaceful and harmonious atmosphere. Complete modern amenities are also set up inside the room, like plasma TV, self controlled air conditioner, high speed internet through Wi-Fi connection, and many more. You have to try to relax in the amazing swimming pool beautifully designed in the middle of the hotel. Enjoy the chic of this unique pool whilst enjoying the view around the hotel and the hospitality of the pool bar service. Besides that, the kid pool is also available for the children. If you want to take care of your body and health, try to visit the fitness centre. With a complete set of the fitness equipments, this place is perfect for exercising your muscles. After that, you could try the professional service of the spa therapists to relax the tense muscles. Dining options at this Kuta resort include a restaurant and a poolside bar. Additional amenities include a concierge desk, tour/ticket assistance, and dry cleaning/laundry services. There are also business amenities such as business center and a well equipped conference room which suites well for both business and leisure guests. 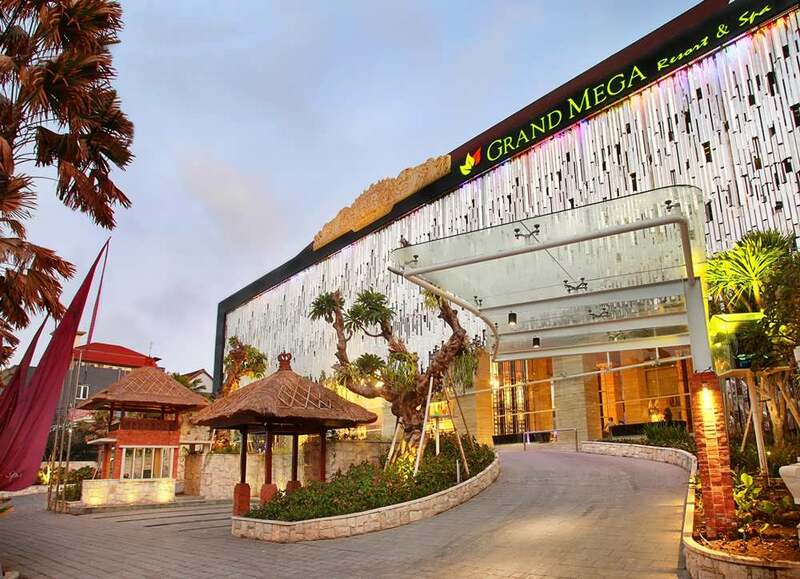 Grand Mega Resort & Spa Bali is an excellent way of staying in Bali. This place is amazing! We are a young couple traveling. We returned from shopping and went to the pool bar were the staff were even more friendly! I am amazed and in love! Hotel room: the room was spotless and gigantic. I love the big bathrooms. Housekeeping did a great job of cleaning every morning. They take pride in keeping their hotel rooms clean. Location: I enjoy the location because their was a mall across the sleep with lots of food options. We didn’t care to be in Kuta centre due to the hotels free shuttle in Kuta.